Youth sports officials are probably some of the most abused people on the planet. They are under strict scrutiny by over-protective parents, dedicated fans, and very competitive athletes and coaches. They are insulted, attacked, blamed and harassed. It’s a wonder they don’t quit. I think I would. Who wants to get paid peanuts to get abused? I can’t count the number of times I’ve heard the phrase, “just let the players play, ref!” In fact, I’ve probably yelled it a few times myself. Until it’s my kid that gets injured as a result of harsh play. And that’s exactly what most officials are trying to do: keep kids from getting hurt. Maybe they go a little overboard sometimes, but they carry a huge responsibility to do all they can to keep kids safe. I think I’d rather have them err on the side of caution than see a young player get injured when it could have been prevented. Not only are officials responsible for the players’ safety, they also have to keep their eye on the clock, be sure the game flows, make the right calls, and watch out for other referees. If they don’t get calls 100 percent right all the time, it’s pretty understandable. Sports parents, do you ever make mistakes in your job? Of course you do! How would you like your boss and coworkers jumping down your throat every time you unintentionally mess up? Yeah, that’s how it feels for the officials you’re lambasting. It’s understandable when parents get emotional about sports, but please remember the bigger picture. Your child is not in the Super Bowl, World Cup, World Series, U.S. Open, Wimbledon, or Olympics. Quite honestly, some parents embarrass themselves when they get so out of control at their child’s youth sports events. Set a good example on the sidelines and remember the kids (especially the younger ones) are there to learn about teamwork and have fun. Your children need you watching, cheering positively, and of course, if they get hurt, but your children don’t need your coaching, your criticisms, or your astute observations. They need to be able to focus on what their coach says. Every official I’ve talked to talks about parents who distract their kids in the game because they insist on inserting themselves into it, instead of just enjoying it as a positive spectator. Obviously, the youth sports official’s job is not a high-paying one. They are in it because they love the game and enjoy working with kids. As much as you’d like to think so, few officials, if any, have a bias or hidden agenda for doing their job. No official wants to get verbally abused. They are all doing their jobs the best they can. Yes, they miss things. Yes, they make bad calls. And yes, they get tired of hearing parents scream at them from the stands when they are trying their hardest to be fair. Let’s have a little grace. This is youth sports, after all! 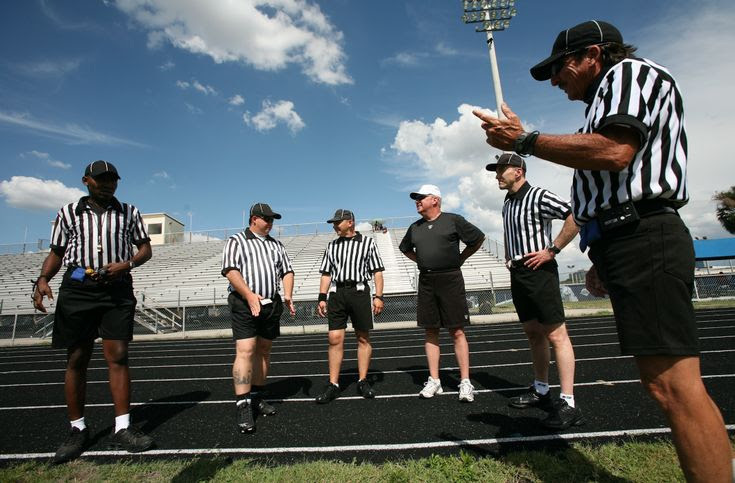 Many youth sports leagues use officials who are certified to work high school games. For instance, in youth basketball, in most cases, the referee is trained by the National Federation of State High School Associations rules. Youth sports leagues are free to create their own policies regarding officials. If they want to let coaches, parents or players officiate, they can. However, most competitive leagues use high school-certified referees. All this to say, most leagues have trained officials and don’t just throw people out there who don’t know the game or their job. When my husband coached high school softball, he always carried a rulebook in his pocket in case he felt he needed to argue a point with a ref. Quite honestly, he rarely needed to use it. The refs always seemed to know the rules. This is a statement I hope all officials would say. As a parent, I want to know the officials working my kids’ games care about the kids — their safety, their love of the game, and the lessons they are learning as they play. I believe even officials can contribute to a positive and growing experience for young athletes. Sports parents, let’s give officials some grace. Even the very best make mistakes, and if you want the good ones to stick around, then stop chasing them away with negativity on the sidelines. If you are a youth sports official, thank you for putting up with us parents. We are not trying to be bad; we just love our kids a lot and sometimes that love pushes us to act a bit crazy. Janis B. Meredith is a life coach for sports parents. She provides resources to help parents give their children a positive and growing youth sports experience. Learn more about how she can help parents have Less Stress and More Fun in Youth Sports.